Anyone who prefers to leave the bivy sack at home or travels through areas with rapidly-changing weather conditions is better off avoiding the warm down sleeping bag and using synthetic alternatives instead. Find out below what to consider when buying a synthetic sleeping bag. Synthetics can be thought of as a giant wad of cotton. The lining consists of minute microfibers that are wound up a thousandfold, trapping warm air in the intervening spaces. If the fibers themselves also trap air to improve heat retention, they are called hollow fibers. This attempt to imitate down synthetically has certain advantages and disadvantages compared to natural fibers. While synthetic sleeping bags are able to stay warm in moisture without clumping together, they have nowhere near as much thermal output relative to down and are less vapor permeable. Additionally, no fill can be lost with synthetic fibers because they form a continuous filament. Another aspect is of course the price: If you want a sleeping bag for any occasion and you're not concerned about weight or pack size, choose a synthetic fiber variant! Synthetic sleeping bags are mainly used when the weather is changeable, e.g., in humid tropical climates or in cold, damp weather. You can also use them if you'd like to spend the night outdoors without a bivy sack. Dew and rain won't compromise the thermal output of a synthetic sleeping bag. Down clumps together and loses its ability to insulate. Synthetic sleeping bags are available as blankets and in mummy style. The former provides more comfort and the latter provides more heat retention. Some models are connectible. 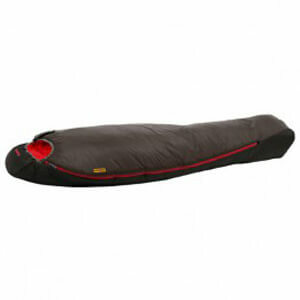 Special women's sleeping bags are more softly lined on the inside and have more insulation in the foot area. Synthetic sleeping bags for cooler temperatures should come with a draft collar. A two-way zipper provides a ventilation opening. Synthetic sleeping bags with L-zippers or U-zippers are even more versatile. Of course, a synthetic sleeping bag alone isn't enough to sleep comfortably. You'll also need to find the right sleeping pad for a good night's sleep. Then you can finally recharge your batteries for the next day of touring.